Hello, dear readers. I'm afraid I don't have it in me to be my usual peppy self for this blog post, but I need some sense of normalcy in my life right now hence my writing this morning. If you are not already aware, I live in Sonoma County, and we, along with other areas of the North Bay Area, have been devastated by fires. At this time, I am still at home safe with my family, but it is heartbreaking to hear about the devastation experienced by so many that have lost their homes. We are currently ready to evacuate in a moments notice if we have to, and I greatly appreciate having my blog more than ever to distract me from the news. I need something positive right now, so let's jump in on today's review. I am really excited to report that Lyn B Designs has created a collection inspired by It's the Great Pumpkin, Charlie Brown. I have been a fan of this festive Halloween flick for as long as I can remember, and it has become tradition to watch it every year in October. The Great Pumpkin Collection consists of four beautiful shades in a variety of finishes. Let's check them out! Green crelly base with orange to green iridescent glitter, blue glass fleck, and holo micro flakes. The Pumpkin Patch is my favorite polish in this collection. I just love this shade of green, and the additional glitters, glass flecks, and micro flakes make it even more interesting. The formula is a little on the thicker side due to all the components, but it was still easy for my to apply to my nails as long as I worked a little slowly. I did have a few of the glitters hanging off my free edge with the initial application, but they pushed nicely back up onto the nail. Photos are shown with two coats plus top coat. 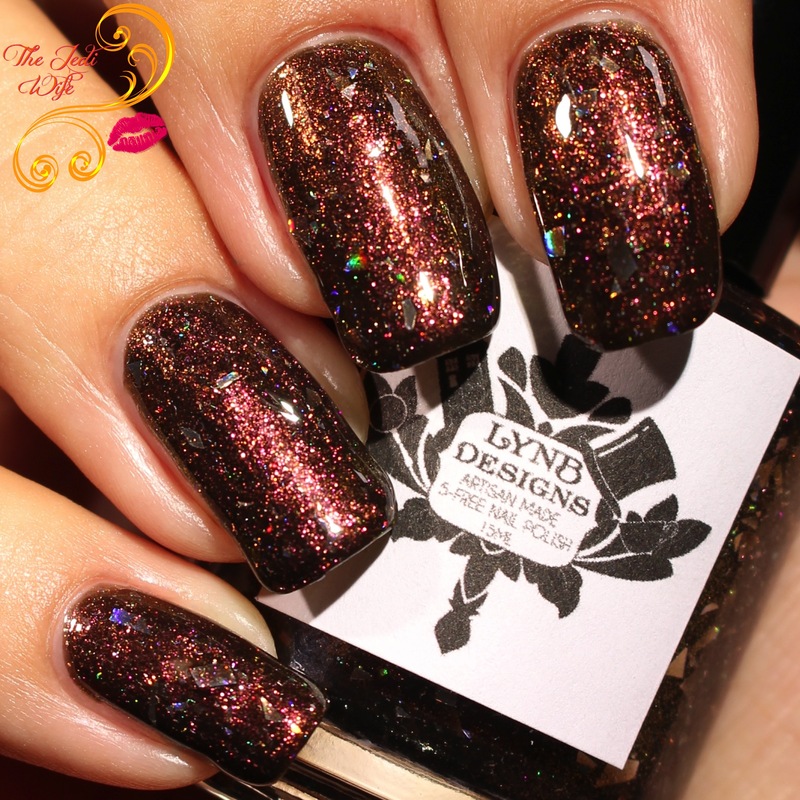 Black base with red to gold shift and holo flakes and shreds. This is such a cool shade! The shreds really pop nicely against the background for a fun look. The base formula is perfection- not too thick or thin, but you will still have to apply slowly and carefully. The shreds are, not surprisingly, a little sharp, and rushing the application can made then dig into and drag the base away. I have it shown here with two coats plus top coat. Bright pink crelly base with linear holo and shifty shimmer from red to violet to blue. While rich, vampy colours are the most common for autumn, it's nice to see such a bright and cheerful pink in this collection! The formula was really easy to work with although you do want to take care not to overwork it, resulting in a thicker and less even finish. I needed two coats for opacity and topped my nails off with top coat for these photos. Indigo base with blue to purple to green shimmer and orange holo sparkle. Religion, Politics, and the Great Pumpkin is another favorite shade from this collection. The orange holo sparkle pops so perfectly against the base colour! I have no issues with the formula to report on this beauty, and I used two coats plus top coat for these photos. The Great Pumpkin Collection will be launching on the Lyn B Designs website this Friday, October 13th at 7pm EST. To celebrate the launch, Lyn B Designs will be offering a 50% off discount from from October 13th through October 16th on any purchase from the store. Be sure to use the code SPOOPY while placing those orders and stock up on other Lyn B Designs shades! Do you have a favorite shade from this collection? I'd love to hear your top picks! Until next time, dear readers, have a wonderful day, and if you could, please send some positive thoughts and prayers our way if you pray. Thank you! Oh my goodness how gorgeous and sparkly these are! The Pumpkin Patch is my favourite, so shiny! Thoughts and prayers! We are in Florida and have had a tough few weeks too. Your gorgeous nails made me smile! Love this product and will check it out. OMG I AM OBSESSED!! I need my toes to look like ALL of these colors!! The Pumpkin Patch is so mermaid-y. I love how that turned out! What amazing shades. I really like that blue color. It reminds me of the sky. Oh my these are absolutely gorgeous!!! This makes me want to grow my nails back out instead of keeping them short for no maintenance LOL! These are all so unique and very eye catching. Wow. I love the variance in these. My favorite polish is the black base reddish one. Perfect for the Fall season. You always find such gorgeous polishes, I have to admit I am loving The Pumpkin Patch myself what a colour! I'm a believer is just amazing. Perfect for autumn. The collection name made me smile! That sounds terrible! I hope your neighborhood stays safe and that the fires abate asap. I'm A Believer is such a stunning polish! I like the range in colors of these. I'm a Believer is so pretty! I just got my LynB order today and am deciding what to wear first. And now you tempt me with even more polishes. The pink and blue are terrific. I'm sending vibes that you aren't affected by the fires. I like the I'm a Believer one. I hope you and your family will be safe and don't have to evacuate so you have to start all over again in another place. The pumpkin patch looks so good. It's perfect for his autumn time. These are all gorgeous colors for fall. I really love the combination of glitter, shimmer, flakes and sparkles that some of these have. The green Pumpkin Patch hue and the I'm A Believer earth tones. i'm sorry that you have had fires in your area. i hope you and your loved ones are staying safe. it seems like there are so many natural disasters happening right now. on a more positive note, the nail varnishes are stunning -- these colors are absolutely perfect for this season! They are all absolutely gorgeous! The indigo one is so pretty! I had never thought of indigo for fall but why not! They are all so gorgeous! I really love the green one; it looks like emeralds. The whole collection is stunning, but that brown I think is my absolute favorite. So sorry to hear about the fires devastating you and your neighbors. Sending positive vibes your way! My favorite shade from this collection is the I'm a Believer. Just really nice, and right in my color palette. Thanks for sharing! I'm a Beleiver is totally my type of shade! So pretty, I love it! Omg so pretty! I'm a believer looks perfect for this season, totally in love with this shade now! I find it so powerful. Oh am sorry about the distress the fires have caused you. I hope you stay safe as you evacuate and more important that your and your loved ones homes are spared. On another note those nails are simply gorgeous!